Today almost everything we buy is in some kind of packaging. There’s cardboard boxes, shrink wrapping, plastic packaging, and more. When we pick up a package we expect it to look nice and no be damaged. No one wants to buy a scuffed or dented package. Although most products aren’t damaged when on the production lines those that do cost the company money. There is a lot of time and money that goes into design, branding, and handling of products and when they get damaged all of that effort is wasted. 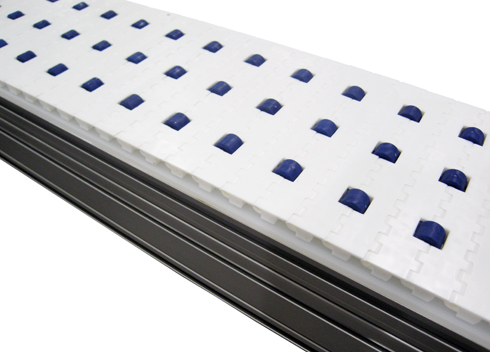 A great solution for places where accumulation is necessary is a conveyor with a roller top belt. The roller belt is similar to a regular plastic belt but it has small rollers placed throughout the belt allowing the product to accumulate as it moves down the line. This type of belt is a great option for low back pressure accumulation and side transfer applications because it allows products to keep moving while they gently accumulating. With product accumulating much more gently they are less likely to be damaged by colliding with other products or the belt scuffing the bottom or sides of the packages. It also is a nice choice because it is a low friction belt it reduces the load pressure and wear on the belt as well as other conveyor parts. This means that you can anticipate longer belt life and less wear on bearings and other components. When time and money is spent on packaging, companies don’t want to waste that by having damaged products. Using a roller belt can help minimize damage to packages while keeping them moving on the line making sure that packaging looks exactly like it’s supposed to when it reaches consumers.